I’m happy to announce that the long awaited (by me at least) Kindle e-book called “How To Withdraw From Your RESP Account Whether Your Child Goes To School or Not” is finally available. For the bargain basement cost of $4.99, you can learn everything you need to know about maximizing the amount of money you get out of your RESP account. Please note that you don’t need an e-reader in order to read this e-book. Instructions for reading this e-book on your computer or iPhone are included later in this article. The withdrawal phase of the RESP is the time when there are the most pitfalls – extra taxes, lost grants and potential penalties are all things to be avoided or minimized. Knowing the withdrawal rules and being aware of various strategies will ensure you don’t make any expensive mistakes with your RESP withdrawals. You have an RESP account (obviously). At least one beneficiary (child) is either currently attending post-secondary education or will be attending in the next year or so. Your child is not planning to attend post-secondary education or quit early. You have read my full length The RESP Book (it’s the same RESP withdrawal material in both books). 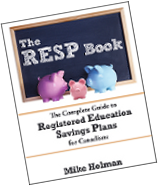 Your RESP account is a group/pooled/scholarship RESP plan. Follow the link if you are not sure what you own. Your child is more than a couple of years away from attending post-secondary education. How do I buy this e-book? There is only one place to purchase this e-book and that is the Kindle Store located on Amazon.com. Note that the Canadian Amazon site does not have a Kindle store. Can I read this e-book without an e-reader? Yes! You can download an app for whatever device you want to use – iPhone, PC, MAC etc. Set up an Amazon account if you don’t have one. Go to the RESP Withdraw book page. Select “Buy now with 1-Click”. On the next page it will say “[your name], we did not find a Kindle device or reading app registered….”. Select which app you want from the list of PC, iPhone, iPad, Android or BlackBerry. Download the app and then run it. At this point you should be able to buy any Kindle book. Consider buying my full length guide The RESP Book. It will take you through the entire RESP process from setting up an account to completing withdrawals. 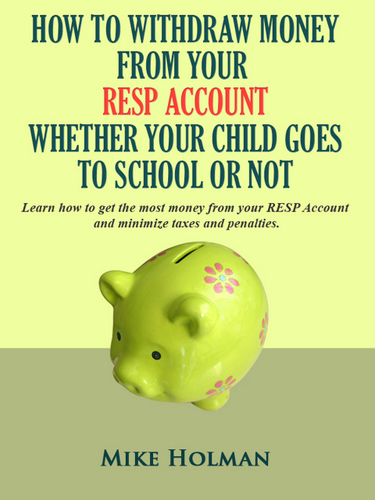 It contains all the material in the RESP withdrawal e-book. How big is the e-book? This e-book is not a full length book. It is about 7,500 words which would be approximately 40 pages if it was a 6″ by 9″ print book. It is roughly one third of the size of my full length RESP book. Congrats on the e-book! Really great stuff Mike! Another book from the RESP guru himself. As I’ve said on here before, I can’t believe that more people don’t take the government’s free money through this program. @My Uni $$ – I agree. It’s free money.